Our mission is to connect people to plants. We do this through elemental herbalism and everyday kitchen remedies. We teach people how to take healing back into their own hands through one-on-one sessions, workshops, and experiences. In our one-on-one consults we’ll explore your unique constitution according to the elements—ether, air, fire, water + earth. Together we’ll create a plan using healing foods, herbs, and self-care rituals as tools for alignment. You’ll walk away with an easy to follow guide that removes the guess work and empowers you to tap into your intuitive wisdom. We create customized herbal meals and menus for individuals and groups. Our recipes work in harmony with the elements of the season, and any unique dietary restrictions. We have on-going private clients in the San Fransisco Bay Area, and we are available for pop-ups and intimate gatherings. Please email us for more details at info@thekosmickitchen.com. Wellness in the workplace is something we’re very passionate about. 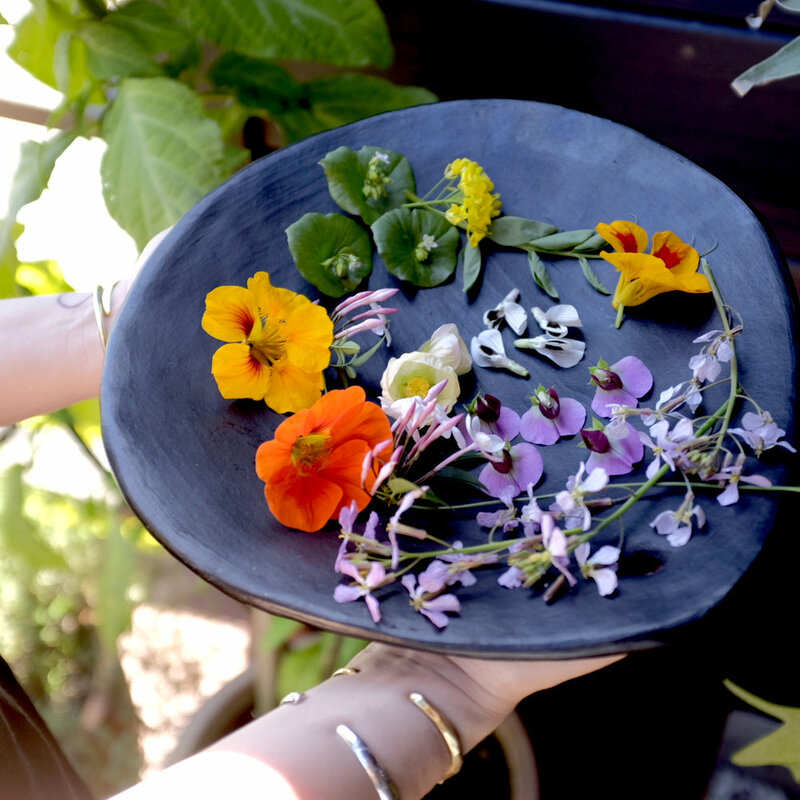 We teach our students how to bring herbal practices out of their kitchen and into their day-to-day lives. Our simple and effective elemental herbal strategies can boost energy, positivity, and creativity. We offer online workshops that include videos, writings, and handouts for our students around the world. Currently we have two offerings, Elemental Herbalism Workshop and our Radical Witch Program. These are both offered about twice a year, please sign-up for our newsletter to receive a registration notification. We love partnering with like-minded brands who care about the earth, what we put into our bodies, and give back. We specialize in recipe and content development and creating unique wellness experiences through herbal foods and workshops. What I loved most about Sarah and Summer's teaching was their message of intuitive eating and using our individual constitution to determine what foods are best for balancing not only our physical bodies, but our mind and spirit, as well. The beautiful recipes we made incorporated tonic and medicinal herbs and were deliciously simple. And finally, one of the most fun parts of class for me was learning the ancient and sacred art of making ghee. The whole process of that, including infusing the golden ghee with herbs, was so empowering and has carried over into my healing home kitchen. I was introduced to The Great Kosmic Kitchen at Spirit Weavers Gathering this year. The title “Be Radical. Eat Traditional” resonated so deeply with me, I just knew I had to join the class. It was amazing to learn about how many things I can add to my meals on a daily basis that aren’t difficult to find, and will be great medicine to my body. I also purchased their cookbook, which was the first I’ve ever read cover to cover.